Mike Easley became the first governor in North Carolina history to be convicted of a felony connected to his conduct in public office after prosecutors and Easley’s attorneys reached a plea deal on state charges Tuesday. Appearing relaxed and confident, the former two-term Democratic governor and attorney general entered an Alford Plea — under which Easley maintained his innocence while conceding that prosecutors might have enough evidence to get a jury conviction. At a Wake County Courthouse hearing, state and federal prosecutors agreed to drop their case against Easley when he pleaded guilty to a Class I felony for violating campaign finance laws. Easley’s sentence could have included up to 15 months in prison. Instead, prosecutors agreed to no jail time and a $1,000 fine plus court costs. Wake County Superior Court Judge Osmond Smith approved the deal. As a convicted felon, Easley won’t be able to own guns, and he could have his law license revoked. The decision ends lengthy state and federal probes into Easley’s conduct in office, based on reports from various media outlets. Carolina Journal reported, among other things, Easley received free flights on private aircraft that were not reported, used state aircraft for personal business, obtained real estate at discounted prices, and failed to disclose rental income from his Raleigh home while his family lived in the Executive Mansion. The state prosecution was launched after the N.C. Board of Elections fined Easley’s campaign committee $100,000 for illegal flights. By the time the elections board could enforce its penalty, the committee was broke and only $5,000 of the fine was paid. Government watchdogs were disappointed that the investigations didn’t lead to a stiffer penalty. Easley’s plea deal stemmed from a single helicopter trip that he accepted from his longtime friend McQueen Campbell in October 2006. Easley’s campaign did not disclose the ride on campaign finance forms as required by law, nor did it include it in 2009 when the campaign amended its disclosure forms to reflect the free use of an automobile that had gone unreported previously. 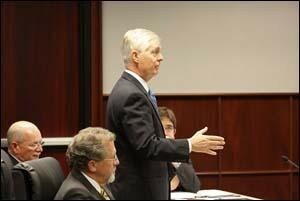 Among the exhibits entered as evidence in court were travel records Campbell provided the elections board documenting dozens of free flights he had provided Easley beginning in 1999, when Easley was attorney general. The elections board said those flights were valued at $87,000. Prosecutors did not charge Easley with wrongdoing in a real estate deal from December 2005 involving the purchase of a waterfront lot in Carteret County. Separate 2006 investigations by CJ and The Charlotte Observer concluded that Easley got a deal on the lot. About a year after the purchase, a tax revaluation found the lot, purchased for $549,000 according to property records, was valued at $1.2 million. In September 2009, The News & Observer of Raleigh obtained the closing documents and reported Easley received an additional 25 percent cash discount at closing on the lot. Also absent were charges that Easley played a role in helping his wife, Mary, land a well-paying job running a speakers’ program at N.C. State University. In 2008, e-mails showed the governor asking a subordinate in 2005 to make inquiries on behalf of Mary, and Campbell (who was then chairman of the N.C. State Board of Trustees) intervened. Mary Easley received an 88-percent pay raise to $170,000 a year in July 2008. Soon after the e-mails were published, Campbell, Provost Larry Nielsen, and Chancellor James Oblinger resigned under pressure. Mary Easley later was fired. As part of the plea deal, U.S. Attorney George Holding agreed to drop his federal investigation into Easley’s personal and public affairs. Rowan County District Attorney William Kenerly, a Republican, said his office didn’t find sufficient evidence to move forward on any non-campaign finance charges. Campaign money never was used inappropriately, only reported incorrectly, he said. Kenerly was assigned to the Easley investigation by the election board after Wake County District Attorney Colon Willoughby, a friend of Easley, recused himself. Sinsheimer disagrees. “If Mike and Mary Easley’s lives have been destroyed as their attorney suggests, it is a result of their own greed and sense of entitlement,” he said. David N. Bass is an associate editor of Carolina Journal.